The Lord shall reign forever, your God, O Zion, throughout all generations. Our reading for today reminds us of all the Messianic prophecies preparing the world for the coming of the Christ. Together with this psalm, we think of Isaiah 35, 49 and 61, and Jesus’ own understanding of his ministry in Matthew 11 and Luke 4. What a blessing that we have prophecy in the Old Testament and fulfillment in the New! But even more, what a blessing that we have a Savior who is Christ the Lord who frees, gives sight, lifts up, loves, cares and sustains! The message of the psalm is that we not put our trust or reliance in the wrong places or on the wrong persons. Few people in our North American context would place our ultimate trust in government, president or prime minister. It is surprising, at times, that people seem to trust too much in “children of earth,” whether parents, spouses or others. At the same time, we trust too much in job, bank account, 401k, worldly treasures which, while important, can be lost in the blink of an eye or a turn of the economy. It’s not that we shouldn’t have a job or income, it’s that we ought not ultimately place our trust and reliance in them. It is God who delivers us, through Jesus Christ, born of Mary, conceived of the Holy Spirit. Let us look to him for all good and to fulfill our every need! Prayer: Hallelujah, Lord God! 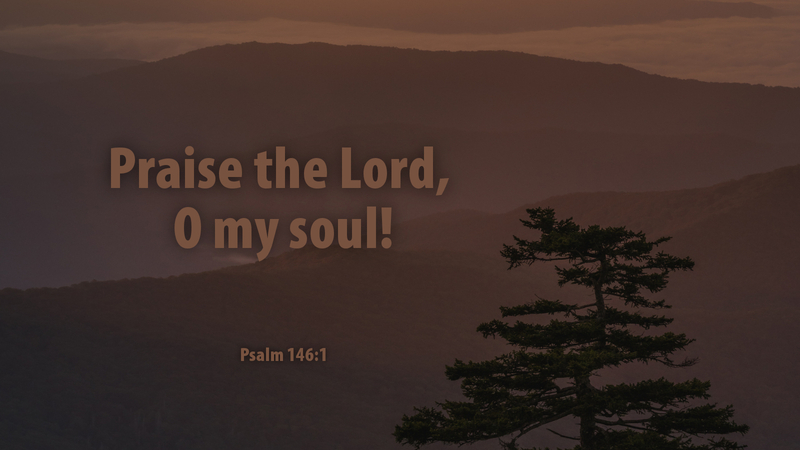 I will praise you as long as I live and place all my trust and confidence in Jesus Christ my Savior! Advent Action: Read the prophecies mentioned above: Isaiah 35, 49 and 61. Enjoy your Devotional reading very much.